- M.A. Gharbi. 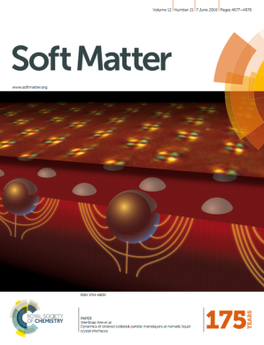 Exploiting imperfections in soft matter to direct assembly of advanced materials. The Institute of Physics, University of Amsterdam. Amsterdam, Netherlands. September 20, 2016. - The Department of Physics at McGill University selected Dr. Gharbi for a lecturer position in Physics. He will be teaching Thermal Physics (PHYS 253) this fall. - Dr. Gharbi is invited to give a talk at the CAP 2016 Congress in Ottawa! The Division of Condensed Matter and Materials Physics (DCMMP). -Dr. Gharbi will be sharing the Session R2-1 “Computational condensed matter” at the CAP 2016 Congress in Ottawa! The Division of Condensed Matter and Materials Physics (DCMMP). Dynamics of ordered colloidal particle monolayers at nematic liquid crystal interfaces, Soft Matter, 2016,12, 4715-4724. Our paper describing the assembly of Au Nanoparticles in Blue Phase LCs is published in ACS Nano and cited in Science! 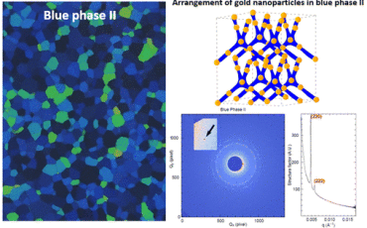 Reversible Nanoparticle Cubic Lattices in Blue Phase Liquid Crystals. ACS Nano, 2016, 10, 3410. 01- M.A. Gharbi. Capillarity at Liquid crystal interfaces: A New Toolkit for Directed Assembly of Advanced Materials. Harvard John A. Paulson School of Engineering and Applied Sciences. Harvard University, USA. Widely Applied Mathematics Seminars. March 08, 2016. 02- M.A. Gharbi. Elasto-capillarity: A New Toolkit for Directed Assembly of Advanced Materials. Department of Physics. Brandeis University, USA. MRSEC Seminar Series. March 10, 2016. 03- M.A. Gharbi. Auto-assemblage de particules colloïdales aux voisinages des interfaces cristaux liquides. Department of Physics. Laval University, Canada. Physics Seminars. February 02, 2016. 04- M.A. Gharbi. Elasto-capillarity: A New Toolkit for Directed Assembly of Advanced Materials. Department of Physics. Syracuse University, USA. Physics Colloquium. January 29, 2016. 05- M.A. Gharbi. Energy Stored in Soft Matter: A New Toolkit for Directed Assembly of Advanced Materials. Department of Physics. University of Miami, USA. Physics Colloquium. January 13, 2016.